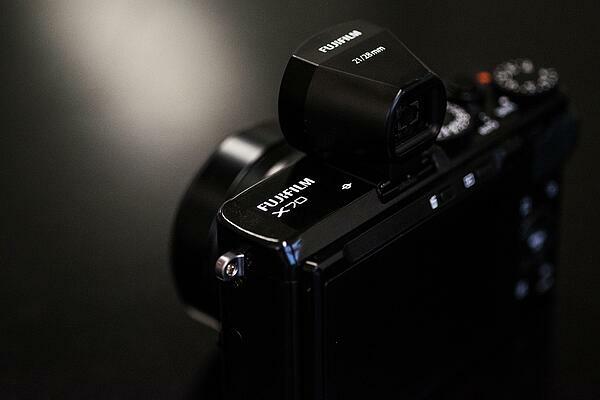 When the Fujifilm R&D team produce an X-Series camera you can be rest assured that image quality is their number one priority. Coming from a heritage of X100 models the brand new premium Fujifilm X70 follows this philosophy. 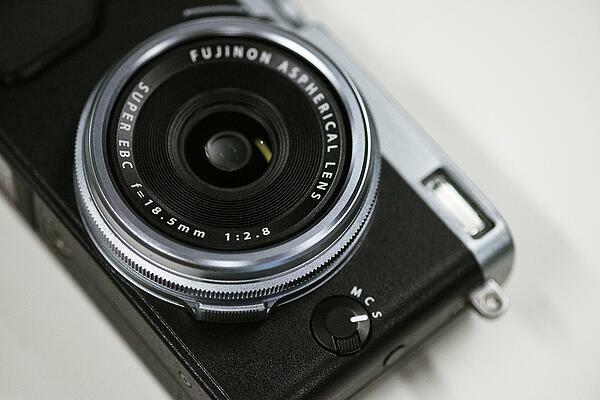 The Fujifilm X70 shares many similar characteristics as the Fujifilm X100 series. 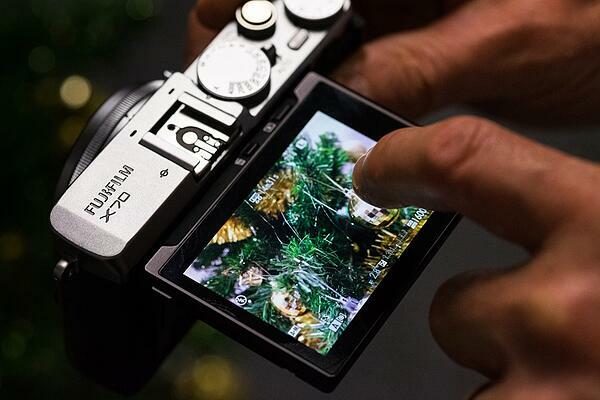 The 16.3 Megapixel APS-C X-Trans CMOS II sensor is still present in the body, while images are superbly processed using the onboard EXR II processor. One major difference on this fixed compact camera is the new 28mm (35mm equivalent) F2.8 lens. The lens design feels unique and well suited for street photography due to its small footprint, and the closest focusing distance of this lens can be achieved at an impressive 10cm. The lens construction includes two large thumb supports that lend themselves to the flexibility of aperture priority shooting on the go. Manual focus also becomes a breeze with a fluent focus ring that sits parallel to the thumb supports. Two popular focus menu options of Digital Split Image and Focus Peak Highlight are also present to assist in achieving pin sharp focus. Turn your attention to the back of the camera and you’ll certainly notice the large 3 inch 180 degree tilt LCD that has the new added option of Touch Screen. This is the first for any X-Series camera, to venture out with this feature and we’re sure it will be a welcome asset to assist capturing the moment very quickly – especially when the electronic shutter is selected. On the actual LCD screen you have the option to change the touch screen settings from either ‘Shot’, ‘AF Area’ or ‘Off’. ‘Shot’ mode enables you to touch where you want to focus and the camera will automatically capture the image after focusing on the subject. ‘AF Area’ is similar to the previous mode; however this won’t take a photo after you press the screen to focus on the subject. The response time is very fast (Phase Detection AF speed 0.08 seconds) and once focused and captured, images can be stored either internally or via the SDHC memory card slot located next to the battery at the bottom of the camera. When viewing the images in playback mode swipe operation can be utilized to view the next photo. 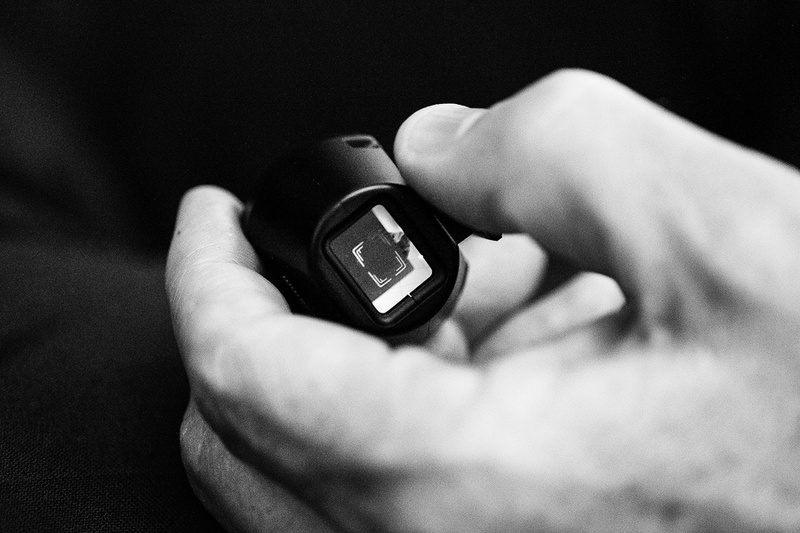 When it comes to accessories there’s an optional External VF-X21 Optical View Finder (OVF). The Optical View Finder includes a built in guide for both 28mm and the optional 21mm Wide Conversion lens (35mm equivalent). The quality of the glass in the OVF is exceptional and only adds a small amount of weight to the already light 340 gram compact camera. Additionally, there’s an optional LH X70 lens hood (pictured below) and a bottom leather case with leather hand strap that can be ordered separately. 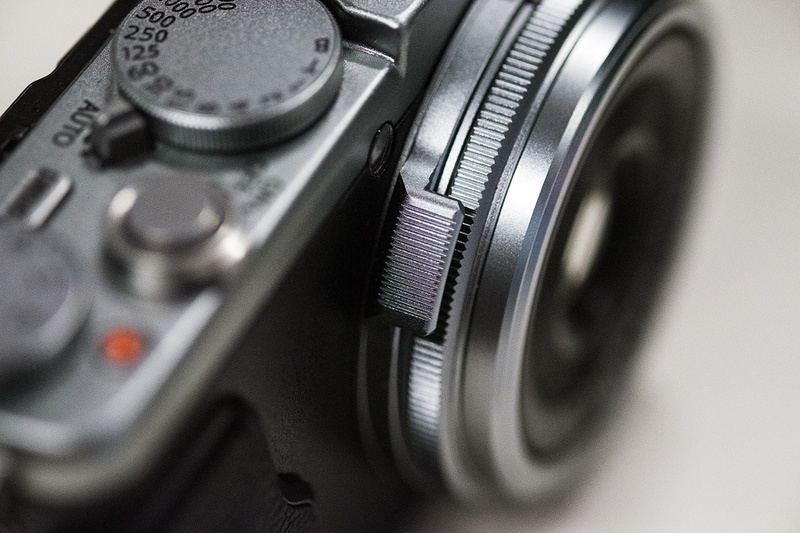 With 8 custom function buttons located around the camera, photographers are able to change settings quickly and conveniently while on location. An example of this is the large ‘DRIVE’ button that’s been repositioned to the top of the camera. 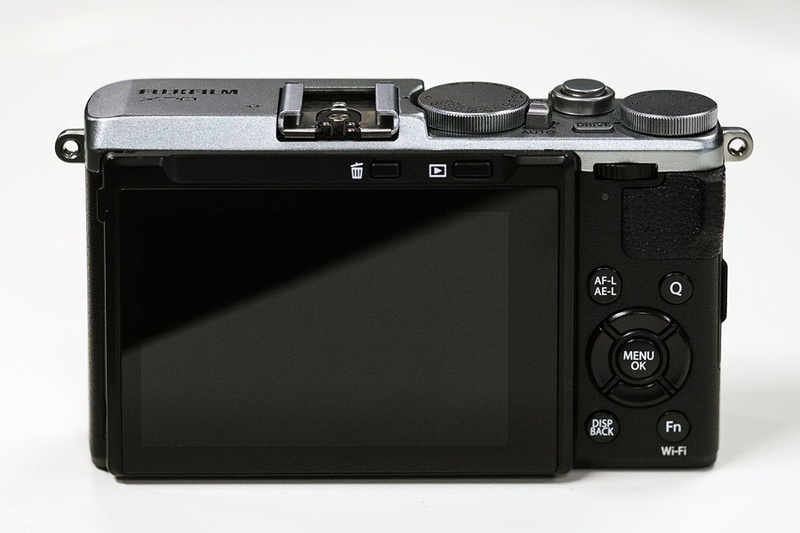 Similar to the Fujifilm X-T10, the X70 introduces the full Auto switch (located next the shutter dial) that lets entry level photographers override any manual settings. 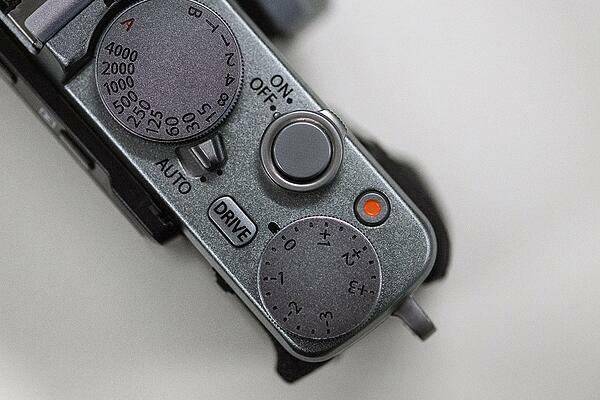 The +3 or -3 stop exposure compensation dial and video record button are also located on the top of the camera. If you haven’t selected Exposure Bracketing, ISO Bracketing, Film Simulation Bracketing, Dynamic Range Bracketing or White Balance Bracketing from the Drive Mode, then you’ll definitely be in the Continuous Shooting setting. Selecting ‘High’ will record photos at 8 frames per second and ‘Low’ will capture images at 3 frames per second. Combine either of these settings with the high responsive AF system and a 0.5 second shutter lag and any moment can be captured in an instant. 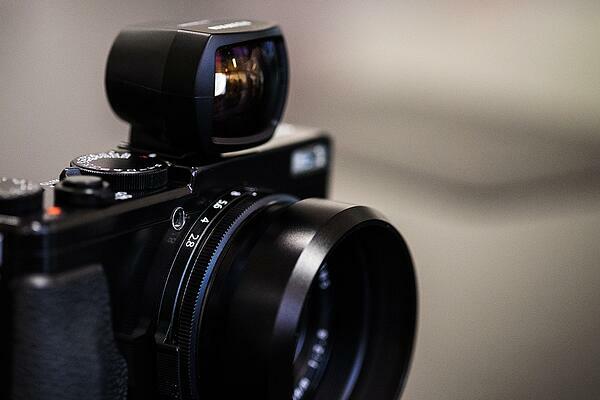 The familiar front facing X-series focus selector has been adopted on the X70. When used in either Single (S) or Continuous (C) mode, 77 focus points can be individually selected and of these 15 offer Phase Detection for the ultimate fast focus experience. Whether you’re using the Electronic Shutter (up to 1/32,000 shutter speed) or Mechanical Shutter, the power consumption is very minimal thanks to an excellent NP-95 battery life that encourages 330 images from a single charge. The battery can be loaded at the bottom of the camera and features an on screen indicator when it’s running low. 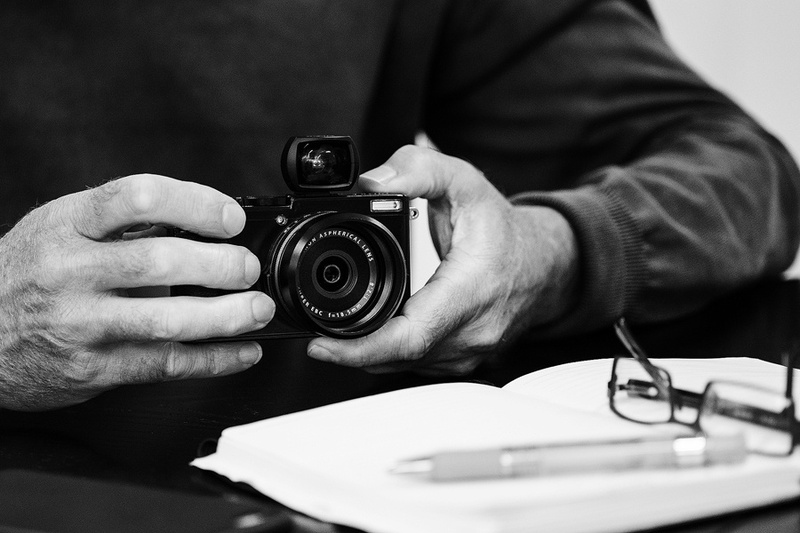 When the X70 is used in full manual mode it begs to be taken out on the street, or alternatively if you opt to photograph in either aperture or shutter priority, travel is also a welcome opportunity for capturing your compositions. Talking about travel, when you find you need to get closer than what the newly developed 28mm lens offers the X70 will offer an inbuilt Digital Teleconverter that can be operated using the Control Ring around the lens(when using either P, S, A, M or Cont. modes). Once this option has been selected you can choose from three different 35mm equivalent focal lengths; 28mm, 35mm or 50mm. As well as manual focus and a Digital Teleconverter option, the adjustable Control Ring will also let you select White Balance, ISO Control and Film Simulation. Additionally to this you may also use the Control Ring to select an Advanced Filter when in the corresponding mode. We’re sure you’re going to love this camera if you’ve come to call an X100 series camera a preferred shooter. Considering what else is on the market in this space the X70 holds its own. With a compact, lightweight and powerful set of features, this camera should be well suited for the majority of the ‘I’m going out’ photographers and professional shooters alike. 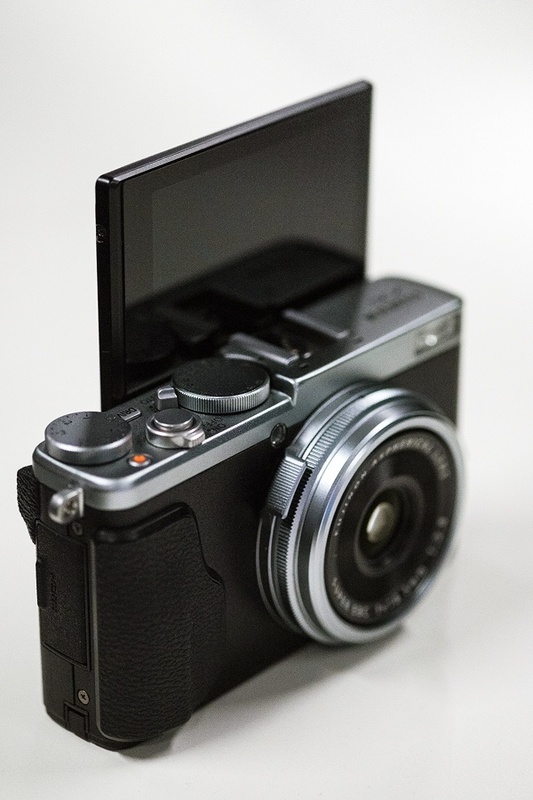 The Fujifilm X70 will be available in Australian retail stores mid February 2016. To find your nearest stockist click here.